Are you looking for an innovative dessert to serve in your next party? Or a nutritious evening snack for your kids? Then Jaggery Samosa can be the answer. Try this out and have your guests and kids eating out of your hands. Heat water in a heavy bottomed pan. Add shredded jaggery and mix well. Roast sesame seeds well in another pan and mix them with jaggery syrup. Knead this mixture into soft dough and divide it into five balls. Roll each ball into a thin circle. Cut it into two equal parts with a knife. Apply little water along the straight edges by overlapping them. Make a cone by joining the straight edges and stuff the nuts into it. 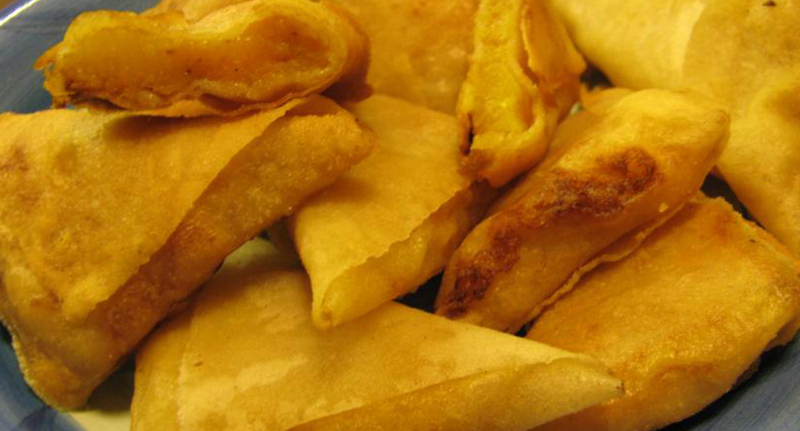 Serve these samosas, garnished with nuts.